Cabaret Club Casino Review 2019 - AU$750 FREE Bonus! You will be drawn in by the state-of-the-art graphics, animations, and sound effects, and swept up by the action and excitement of more than 300 games. At Cabaret Club, whether online casino play is a new activity for you or a pastime you have been enjoying for some time, finding a site that will take your action is easy. Here in Australia there are plenty, so don't just pick one you know nothing about, hoping it will be okay. A fair chance to win. CabaretClub Casino meets these criteria and more. Cabaret Club is one of several casinos that are part of the esteemed Palace Group. It is also relatively new when compared to the other Palace group members; Spin Palace, for example, has been operating successfully since 2001, while Cabaret Club Casino first came on the scene in 2009. But like its sister casinos, Cabaret Club Casino is licenced by the LGA of Malta, and is eCogra certified, and powered by the latest cutting edge software from Microgaming. The eCogra seal of approval means that all of the games have been thoroughly tested for fairness to the player. In fact, you can read the monthly updated reports from this independent auditor online. The Microgaming name, one of the most trusted in the online casino industry, gives you the additional assurance that the casino is a safe and secure place to play. All transactions are digitally encrypted, so your security is guaranteed. In addition, you get to enjoy a great variety of games, taking advantage of the most up-to-date features of modern technology, without the time and expense of having to travel anywhere. Of course, that includes playing all your favourite pokies, and you can even try brand new games. To take this one step further, we would like to mention the Cabaret Club mobile app. You can enjoy a great variety of games anywhere you would like as long as you have a smartphone or tablet and a solid Internet connection. You can read more about this great app further down the page. Cabaret Club Casino offers all new players a welcome bonus upon first signing up and making an initial deposit. The casino will then immediately give you a 100 per cent match bonus of up to $750. While some casinos heavily promote bigger welcome bonuses, these tend to be spread out over weeks or months and there is also a trade off: bigger deposit and wagering requirements. Here, if you wish, you can deposit as little as $20 for a $20 bonus, which is great for small players. But, of course, no casino lets you just take the money and run. As at other online casinos, the bonus comes with strict "playthrough" requirements for withdrawal. At this casino, the playthrough is 50x the bonus, and all of the stipulated play must be completed within one week of opening your account. Furthermore, only pokies and parlor games count 100 per cent toward meeting the wagering requirement; other games count substantially less or not at all. For example, roulette and most forms of blackjack and video poker only count 8 per cent. So instead of having to wager the bonus 50x, which is already a hefty sum, you would have to wager the bonus 625x! In other words, the welcome bonus is practically useless for non-slot play. On the other hand, many casinos require as a condition for withdrawal, playthrough of both the bonus and the player's deposit, and even then, the bonus is not available to be withdrawn. In addition to the welcome bonus, CabaretClub has a loyalty rewards program whereby continued play allows you to take part in special promotions, receive tournament invitations, and earn more rewards and bonuses. Every player becomes a member of the casino's Loyalty Club from day one, and is given 500 points to start. Thereafter, every EUR 10 wagered earns you one additional point, although only pokies, parlor games, and American roulette count 100 per cent. Other games count for substantially less; for example, craps, baccarat, and most forms of blackjack and video poker all only count 10 per cent. But you can also earn double or triple points simply by playing selected games of the month. Every 1,000 points is exchangeable for EUR 10 in free casino credits. CabaretClub Casino has six loyalty tiers: blue, silver, gold, platinum, diamond, and Prive. As you move up in level, your player rewards increase correspondingly, including bigger monthly bonuses and lots of other perks. At the gold and higher levels, players receive a VIP manager, special gifts, and invitations to exclusive competitions and promotions. Diamond and Prive members receive special VIP invitations, such as to major sporting events, faster withdrawals, and customised bonus offers. All customers receive monthly newsletters via email. The newsletters keep players informed about the latest promotions and give them the opportunity to take part in ongoing cash prize competitions. Play at Cabaret Club with your AU$750 Bonus Now! At this Cabaret Club, rather than being entertained by a singer, you will be drawn in by the state-of-the-art graphics, animations, and sound effects, and swept up by the action and excitement of more than 300 games. Also, at most cabarets, after doing nothing but watching someone else perform for an hour or two, you will probably have had enough. 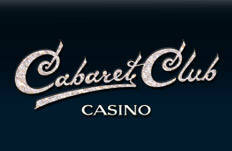 At the Cabaret Club Casino, you can stay and play all night on your Mac, PC, or mobile device and still not get bored! Downloading the sophisticated but user-friendly Micrograming software and opening up your account will take just a few minutes, after which you can play any game you wish. Or, if you prefer, you can choose the no download instant play flash version offering fewer games. If you love playing the pokies, and what Aussie gambler doesn't, you will have come to the right place because CabaretClub Casino has more than 100. Choose your favourites from traditional three reel pokies, action-packed five reel video pokies, and progressive jackpot games, on which one lucky spin could make you a multi-millionaire. Cabaret Club Casino also offers a lot of exciting table game options. If you enjoy playing roulette, you don't have to confine yourself to American Roulette. You can opt instead for the more favourable to the player European or French Roulette. You can also play European Roulette Gold (three dimensional) or Roulette Royale (with a progressive jackpot). If blackjack is your game, you have an even bigger variety choice. CabaretClub Casino offers you classic blackjack, along with Atlantic City, European, Vegas Strip, and Vegas Downtown versions, and more. Just familiarise yourself beforehand with the specific rules and basic strategy for whatever variation of the game you are playing to maximise your chance at winning. If you have a Flash-enabled browser on your mobile smartphone or tablet, you can definitely play at Cabaret Club on the move simply by opening up your browser and typing in cabaretclub.com. This is especially useful for Blackberry and Windows Phone users who want to play on the go. If you have an Apple iOS device or Android device, you can download the app directly onto your device and start playing in a matter of minutes. You can find the app at Google Play and the Apple Store. The games on the app are powered by Microgaming. While the app does not offer as many games as the website does, you can still choose from a lot of different games, including roulette, poker (Aces and Eights), and pokies (Mermaids Millions, Hitman, and Adventure Palace). No further downloading is required. Many good online casinos offer apps for their busy players so they can gamble online anywhere they want. It is actually a smart business move because making their online casino mobile allows a casino to attract more players. Not everyone has time to sit in front of a computer and start a gambling session. It is so much easier to just whip out a mobile device and dip in for a quick session. With everyone being so busy these days, mobile gambling is a growing industry and many online casinos are getting in on the game, including Cabaret Club. Mobile casino review sites will encourage you to try out mobile gaming. It is incredibly convenient, especially with online casinos everywhere making their apps and Flash-based in-browser interfaces as easy and user-friendly as possible. Anyone reading this CabaretClub mobile casino review should give mobile gambling a try! Crossplay: Yes. You can log into the app with your existing Cabaret Club account. If you don’t have a Cabaret Club account, register on the app. If you have a Cabaret Club account, log in. Open up www.cabaretclub.com in your favourite mobile browser. If you have an existing CabaretClub account, please log in first. You see the “Play Now” button? Go ahead and click that. You will see a pop-up asking you whether you want to play with real money or practice money. Choose your option. If you have not logged in, you will be prompted to register. If you already have an existing Cabaret Club account but have not logged in yet, click the link at the top of the page: “I already have an account”. Once you are all registered and logged in, you can start playing! By the way, if the casino does not open up on your mobile device, it’s possible that the browser is either outdated or not compatible with Flash. As you will see from the list below, players at CabaretClub Casino can choose from many fast and secure banking methods. Most, but not all of the deposit options can also be used for withdrawal. Processing times for withdrawal vary with the method. E wallets are the quickest (within 24 hours). Bank transfer transactions take three to five business days and credit and debit card transactions up to seven business days. Accepted currencies include AUD, along with USD, EUR, and GBP. Customer support in 17 different languages is available to answer your questions or help you with any banking or play matter. See the instructions provided on the website to access their help 24/7 via live chat, phone, or email.